After the Russians saw a bit of action in Afghanistan they decided they needed a new attack helicopter to replace the Mil Mi-24 Hind. The Hind was found to be too big and lacked the maneuverability needed in tight areas of conflict. The new attack helicopter needed to be smaller but able to carry a large variety of weapons. The Mil Mi-28 and Kamov Ka-50 were the two helicopters created to replace the Mi-24 Hind. 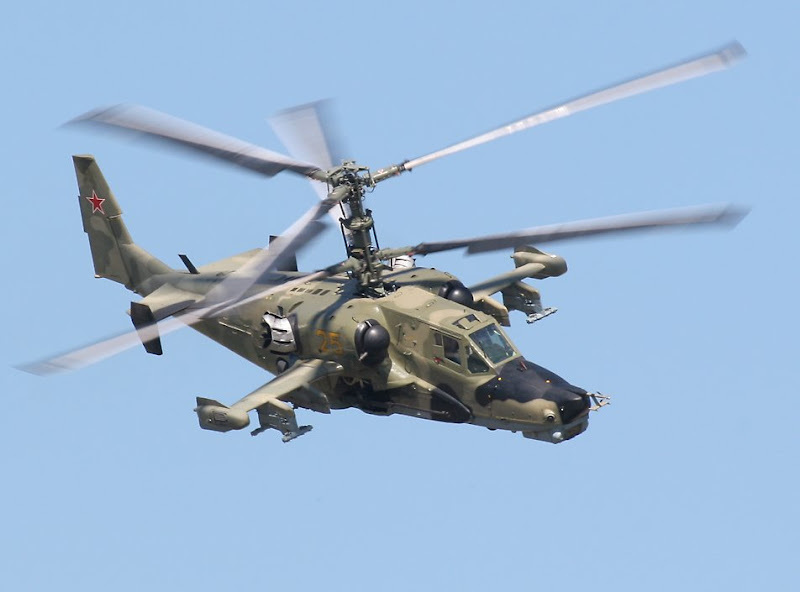 Both helicopters have entered service, but the Ka-50 Black Shark ( NATO reporting name Hokum A ) has been chosen as a support helicopter for the Russian Special Forces, while the Mi-28 Havok is the Russian Army gunship. Kamov designed the Ka-50 to be small, fast and very agile. Unlike any other gunship in the world, to this day the Ka-50 is the only single seat attack helicopter. This was one of the aspects of the design that held the Ka-50 back. Military officials considered operating the helicopter by one person to be highly dangerous. Two pairs of eyes are better than one was used to emphasise this important aspect. However, Kamov claimed that in light of helicopter combat studies performed during the war in Afghanistan, a single pilot attack helicopter was the solution. Kamov argued that a typical attack helicopter mission requires going to a conflict area, acquire the target, shoot the target and come home. Navigation, maneuvering, weapons operation and target acquisition are not simultaneously required. The question wheter the combined workload doesn’t fatigue the pilot remains to be answered. Another important characteristic of the Ka-50 and the two seat Ka-52 is the contra-rotating coaxial rotor. This removes the need of a tail rotor. This solution enables the helicopter to achieve higher speed, improves the maneuverabilty and also improves safety. By using two smaller rotors, the overall speed at the tip of the blade is lower than in the case of a classic configuration. This in term, means that the Ka-50 can reach a maximum speed greater than classic configuration helicopters. The helicopter can perform loops and rolls, as well as “the funnel” which is basically circle strafing. Also, the lack of a tail rotor means there is no critical equipment in the tail ( such as a gearbox) that, in the case of direct hit, can endanger the helicopter’s survivability. The main gearbox is safely mounted between the two engines and is therefor highly protected. The Ka-50/52 is fitted with two Klimov TV3-117VK turboshafts that produce some 4,500 horsepower together. And because all that power is transmitted to the rotors, the helicopter has a great payload. Some 2 and a half tonnes of rockets, guided and unguided missiles or gun pods can be carried on the four hard points. In January 2001, the Ka-50 saw its first combat operation, as it fired on enemy positions in Chechnya. The Ka-50 turned out to be a somewhat successful attack helicopter. The Ka-52 was developed on the Ka-50 airframe and was designed to fight against enemy frontline helicopters. 12 are to enter service by 2015. 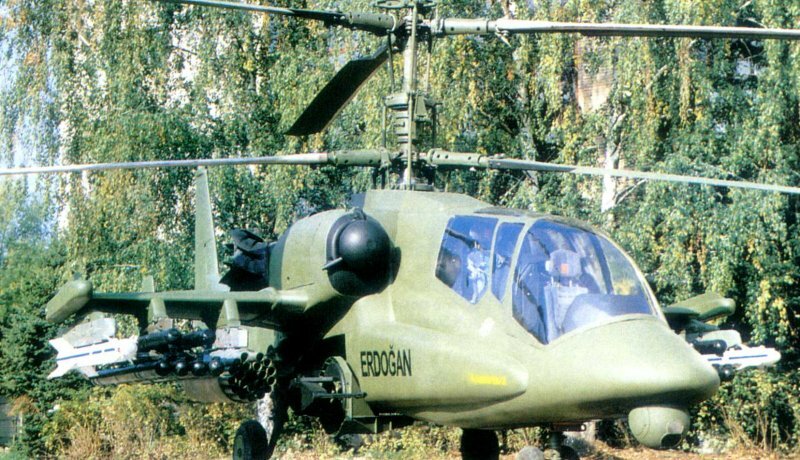 Another helicopter developed using the Ka-50 airframe is the Ka-50-2 Erdogan ( means Born Warrior in Turkish). This is a two seat tandem configuration helicopter createad to participate in Turkey’s attack helicopter tender. The Turkish Army found it to be better than the Eurocopter Tiger and the AH-64 Apache, but the Italian Agusta A-129 Mangusta went on to win the contest. Still, the Ka-50 Black Shark and Ka-52 Alligator have entered in service with the Russian Special Forces, and as funding will be available, many more will come. I like ka-50 very much! Could someone explain the ejection seat feature on this helicopter? Theoretically, a split second before actual ejection, explosive charges blow off the rotor blades. This is supposed to allow for a safe ejection. wow, those videos were incredible. what an amazing aircraft. Russia has always been the class of the world when it comes to helicopters. it appears this will continue into the foreseeable future. That should do an excellent job of strafing unarmed American civilians from sea to shining sea, just like they did in Afghanistan! And I don’t mean unintentional or accidental collateral damage either, I mean the intentional slaughter of unarmed civilians as a means of depopulation, which anyone who knows anything knows is a standard and common tactic of the Soviet military who’s longstanding history of murderous brutality upon civilian populations is a matter of record. Just ask any Afghani survivor if you can find one! Coming soon to the skies of America! COUNT ON IT! WOLVERINES!! Yeaahhh Americans are doing even better job in Iraq then Soviets in Afganistan!!! Just ask any Iraqis!!! That is one wicked machine! This is one of the best coaxial helicopters of Kamov OKB. Ka-50 is helicopter for the future.